Click the drawing to view a detailed drawing of the site in .pdf format. To play a Windows Media Video of the details of the machinery at the site, click the above image. Click on the drawing to view a detailed photo-mosaic of the site in .pdf format. Point, Duluth in Lake Superior in about 8 feet of water. A small portion of a shipwreck was discovered Sunday, February 18, 2007 by a young girl named Sophie, while she was skating on clear ice with her dad, John Williams near Minnesota Point in Duluth. 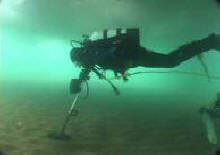 Her dad and neighbor Steve Sola drilled a small hole in the ice to insert a drop camera and view the wreck. The little girl’s exciting discovery was captured in the Duluth News Tribune paper and broadcast on TV stations in Duluth and Minneapolis. 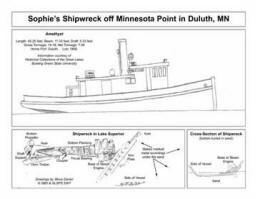 The shipwreck, located in Lake Superior about 150 yards from shore, south of the Lift Bridge was named after the little girl, as the SS Sophie, since its real identity was unknown. Jay Hanson, a member of the GLSPS Duluth Chapter and a group of divers checked out the shipwreck on Thursday, February 23rd. They noticed that the keel was broken and some poured concrete which was on top of the keel in the rear, may have been used for ballast. They also found pieces of boiler plate buried in the sand near the marine gear and an 18-foot keel timber near the front of the wreckage. From its location, it was originally thought that the wreck might be the 81-foot tug Inman. The tugboat had a beam of 19 feet and a gross weight of 89 tons. Junked in 1916, the tugboat was being burned and broke away during the process, sinking to the sandy bottom off Minnesota Point. In 1986 some large pieces of wreckage that came up near the south pier of the Duluth Ship Canal were noted as being from the Inman. Jay Hanson's team makes the first exploratory dives. 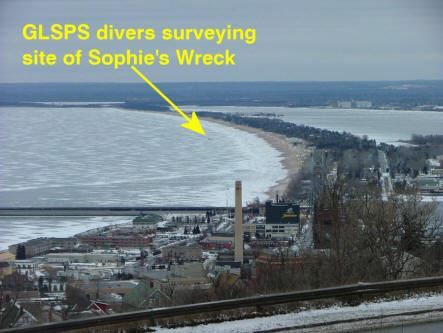 The GLSPS conducted an ice dive on the shipwreck near Duluth on Saturday, February 24th to document the details and help determine its identity. Jay Hanson, Corey Daniel and Ami Rose were present from the GLSPS Duluth Chapter. Mike Stitch, Pat Brinkman, Ken Merryman, Phil Kerber and Steve Daniel arrived from the Twin Cities. Jon Connolly and Joe Burnett also helped. Sophie and her father came out on the ice with friends to observe the exciting discovery. 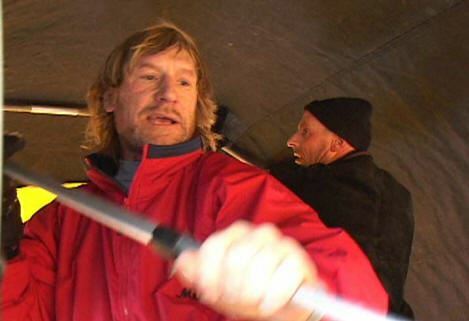 Phil and Jay tended the lines inside a canvas ice house as Mike and Pat went down with an underwater metal detector to search for metal pieces of the wreck that were buried in the sand. 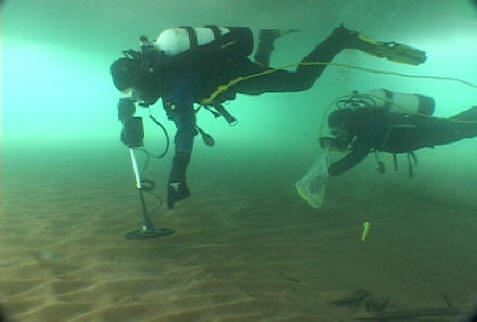 After video was made of the wreckage, Pat placed stakes in the sand to outline areas that provided firm responses on the detector. 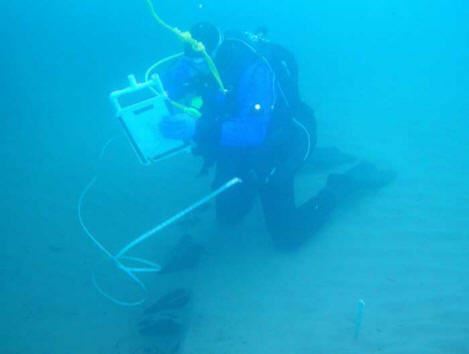 Corey helped Ken measure the wreck, including the stakes that indicated buried portions under the sand. Steve made a drawing of the wreckage and took underwater pictures for later study. Measurements obtained from the shipwreck may rule the 80-foot Inman out, as they don’t seem to line up with the proportions of a tug this size. 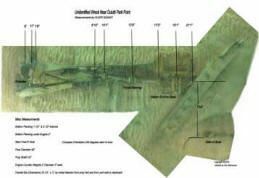 The wreckage measured 33.5 feet from the propeller to a forward section marked by a reading on the metal detector. The overall length from the propeller hub along the keel to the point where the shaft extended out of the base of the small steam engine was 21 feet 1 inch. The width of the site is 10 feet when the stakes marking points noted on the metal detector are included. The outside piece of hull measured 7.5 feet from the keel. It was assumed that the beam of the boat was 15 feet, although it is possible the section under the sand may be broken, suggesting the beam to be wider than it may actually be. Divers enter water on initial dive on a sunny February Day. The base of the engine block measured about 3 feet. A puzzling fact was that the two counterweights by the engine base were fastened to the shaft with a pin and appeared to be somewhat hollow (like a jar lid with a lip). One would expect counterweights to be a more solid structure, considering typical engine construction. The counterweights were two feet in diameter, with a width of three inches. The shaft coming out of the engine was four inches in diameter. Planking under the engine base was two inches thick, while the bottom planks under the propeller shaft measured 1.5 inches thick. The propeller diameter was 52 inches. It was felt that the light weight vessel planking, the 6 inch wide sternpost and the engine base appeared to be a bit small for an 80-foot tug, such as the Inman. 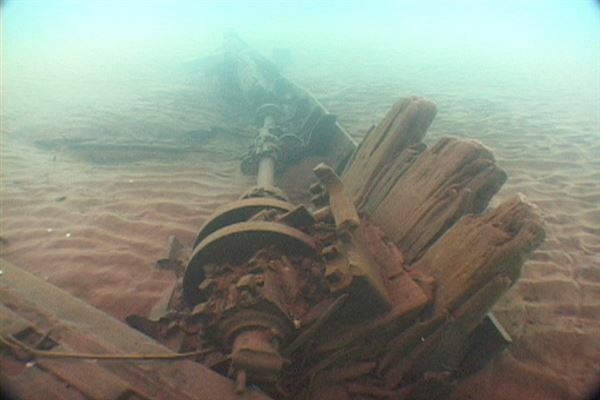 The Inman had a double expansion (two cylinders) steam engine and this boat has the remains of a single expansion, single cylinder, steam engine. The dimensions of the wreckage indicate that it may have been a fish tug or a tugboat 60 feet or smaller. The wind began to pick up in the afternoon, causing concern for potential ice movement. 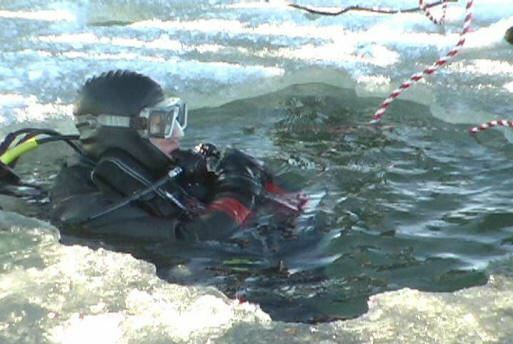 The dive teams returned to the surface and helped pack out the gear to the vehicles on shore. The dive was a successful event and enjoyed by all the visiting observers, as well as the divers and their support teams. The GLSPS appreciated the all the information provided by the news media, historical and archive persons, nearby residents, other visitors to the site and the divers who visited the wreck beforehand. Jay Hanson volunteered other possibilities he found through research to consider, such as the 75-foot tug Sara Smith that burned at anchor off Minnesota Point in 1908. 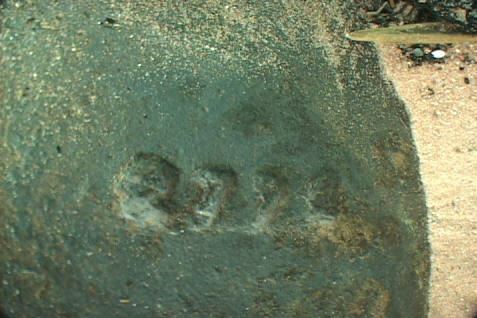 Jay also found information on the Amethyst, a 45-foot tug that was lost in 1888. Duluth was her home port. The tug had a wood hull with a beam of 11.33 feet and a draft of 5.33 feet. Her gross weight was 14.18 tons and net tonnage was 7.09. The measured size of the of the wreckage suggests it may possibly be from the Amethyst. 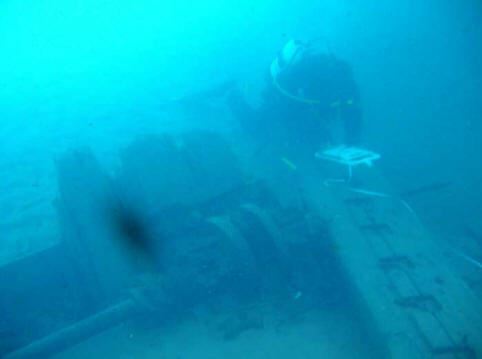 Additional research and a possible visit to the wreck site with the< Preservation in warmer weather will be done to help determine the true identity of the shipwreck. Corey Daniel makes one of many trips to transport tons of gear to the site. Mike Stich and Pat Brinkman set up Phil Kerber's ice house. 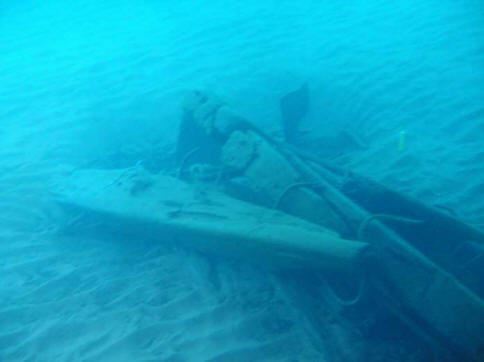 Propeller and sternpost of new wreck. Note the hanger bearing with the rope wrapped around it. Looking toward the stern from in front of the base of the single cylinder steam engine. 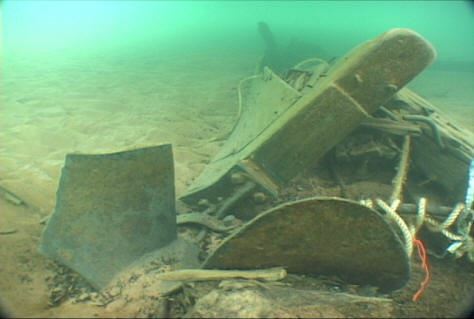 The piece in the lower left corner is a broken length of the keel from forward of the engine. The numbers stamped on the propeller 2771. 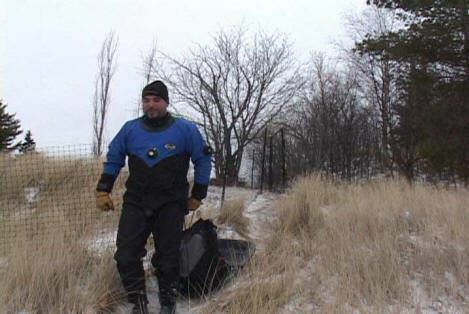 Mike Stitch and Pat Brinkman use metal detector to find buried wreckage. A view of the horn timber above the stern portion of the keel. 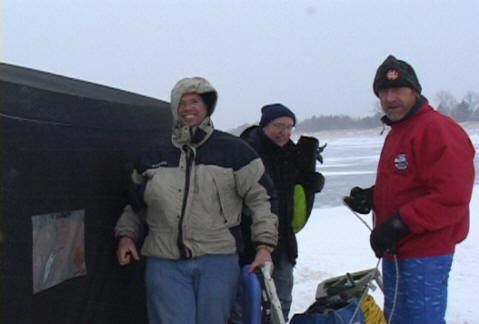 Mike Stich, Jon Connoly, and Ken Merryman load the sled for the long trek back to the truck. The weather deteriorated in the afternoon. Ken Merryman measuring the broken section of keel. Corey Daniel records ship side measurements.